Benjamin Hill was born in Warwickshire, in 1617 and was baptised on 22nd March at the local church at Hatton, only a couple of miles from Warwick city, the elder son of John Hill, a wheelwright. He was apprenticed through the Blacksmiths' Company in the summer of 1632 at the age of 15 to Richard Child, a clockmaker, of Fleet Street, London. At that time he was described as being from Rowington, in Warwickshire, the neighbouring parish to Hatton, perhaps because that was a better-known place than Hatton. The village of Hatton straddled the main highway, the old post road as these major routes were called, from Warwick to Birmingham, the kind of location where blacksmiths and wheelwrights had always set up shop to catch the trade from any passing travellers in difficulty. Rowington was just off the main road and we can be sure that a wheelwright lived right beside the main road, which would put John the wheelwright at the Hatton end of Rowington. It must have been the seventeenth century equivalent of a pre-motorway service station and repair shop. I always wonder how a country craftsman, such as wheelwright John Hill, came to send his fifteen-year-old son for a spell of live-in training in London, when he might barely see the lad again for the next seven or eight years and when the chances were he would spend the rest of his life in London. It cannot have been an arbitrary decision. They must have had some family connection with London or perhaps with some member of the Blacksmiths' Company, but it is almost impossible to unravel such connections, especially with a name as widespread as Hill. A very detailed article by Jeremy Evans in Antiquarian Horology for March 2001 recorded much of Benjamin Hill's background, some of which ground is necessarily covered again here. But I wondered whether I might learn a bit more about him by looking at those people he associated with. Perhaps there was some connection with Richard Child. Richard Child was a maker of lantern clocks. I personally know of only one clock by him, that one signed on the fret 'Richard Child in Fleet Street', but others must survive. What do we know about him? Well, the first we hear of him is that he was a member of the Blacksmiths' Company by 1629, becoming Steward in 1634. As with many other clockmakers of the day the Blacksmiths' was his natural choice of Company before the formation in 1632 of a separate Company for clockmakers. But as soon as it was established he joined the Clockmakers' Company, becoming a 'Brother', as those second-class members were termed, who could not technically be full Freemen if they had not been apprenticed through the Company. Amongst other technical restraints imposed on Brothers, though only, it seems, on those whose faces didn't fit, was the fact that that they were not allowed to bind apprentices through the Company nor to work as a master in their own right. Of course in 1632 nobody could have already completed an apprenticed through the Clockmakers, which had only just been formed. For those Clockmakers' Company members belonging to some other City Company before 1632, there were always disputes between the old and new companies, each wrangling over who had the strongest claim to the member's allegiance and, perhaps the most important bit, their subscription money! Richard Child joined the Clockmakers' Company immediately in 1632, rising through its ranks to become an Assistant in 1637, a Warden from 1641-44, and would ultimately have become Master but for his premature death, probably in that latter year. 1. A balance-wheel lantern clock of the 1650s signed on the fret 'Beniamin Hill in Fleete streete', in exactly the way his former master signed his clocks. The iron hand is original though of unusual style. In 1635 he was still taking apprentices through the Blacksmiths Company, but in November of 1638 he took two through the Clockmakers' Company by the roundabout method which was used regularly of binding an apprentice 'through' another member. Strictly speaking he was not allowed to do this, but binding 'through' another was a method used by all Brother members. The Blacksmiths were up in arms about this and in 1638 were to sue him 'for breach of oath', though it is doubtful if anything came of this. With most such Companies their bark was worse than their bite. Richard Child was alive in 1644 but dead by 1650, when in that year and the next the Clockmakers' Company gave a charitable payment to his widow to buy her children 'hose and shoes'. This was followed by occasional further grants for the next fifteen years, a measure of the dire conditions of life for those left with no breadwinner! In 1638 Richard Child was established in Fleet Street, aged, as far as we can guess, about 38. His household may also have included Henry Child, who was probably his brother and still an apprentice in the Goldsmiths' Company and who later also made lantern clocks. Young Benjamin Hill would also have been in that household, still an apprentice and aged 21. Richard Child was working next door to, and possibly doing outwork for, the notorious John Drake, a watchmaker, who had been a Blacksmiths' Company freeman since 1609 and was now in his fifties. John Drake's house was then assessed at a rateable value of £20, alongside Richard Child's at over £26, whereas just up the road was Edward East, a much more famous name today and later to be the King's Clockmaker but then aged 36, whose house was rated at only £18. This might imply that Richard Child was far more prosperous at that time than the others and yet by 1650 his widow could not buy shoes for her children. A little further up Fleet Street in 1638 was 'the widow Grinkin', her house rated at £25. She was the widow of late very prosperous Blacksmiths' Company member and watchmaker Robert Grinkin senior, who had died in 1626, and in which household his two sons, Edmund and Robert junior (both aged about 28) continued the trade, also Blacksmiths' Company members. Robert junior, who had joined the Clockmakers' Company as early as 1632 seems to have divided his time between London and Exeter, we don't yet know why, but as it was in the Civil War period, we might guess. Eventually Robert Grinkin became Master of the Clockmakers' Company and must also have known the Child and Hill families very well. Within the year the widow Grinkin herself was dead and the household was then run by Robert Grinkin junior, of whom more later. John Drake was a man of violent temper, who took no prisoners. If you rubbed him up the wrong way, he could well have been the 'neighbour from hell'. He was then (1638) fifty four years old but showing no signs of mellowing. He always regarded his first loyalty as being to the Blacksmiths' Company, through whom he took no less than nineteen apprentices, not all at the same time of course, but over a period of nearly half a century. This suggests his workshop was a busy place. Even though he had actually been an original subscriber towards the formation of the Clockmakers' Company, he never could get on with what he, and a good few others, saw as a corrupt administration. He refused to hold any office in that company. In 1633 he was forced to write a letter of apology for his 'intemperate and disgraceful speeches' and humbly begged permission to take another apprentice. I find it difficult to imagine John Drake 'humbly begging'. In 1654 he was obliged under direct order from the Lord Mayor to pay the 15 years of arrears he owed, but 'did use reviling language against the Master, calling (him) a turd and a shitten fellow and using other opprobrious words to the disparagement of the Company' and he was to be summoned next court day to account for his evil language. In 1656 he joined a group of rebels trying to overturn the administration in a protest to the Lord Mayor about their conduct. In 1661 he was summoned before the Clockmakers' Company court to answer complaints, but he ignored them. He never did conform. The relevance of the Drake and Child families to Benjamin Hill may emerge later, and even of Edward East and the Grinkins. Returning to Benjamin Hill, he was made a free Brother in the Clockmakers' Company in 1640, but strangely not free of the Blacksmiths till the following year. When he began working in his own right is unclear but it is very likely he worked for Richard Child as a journeyman for a few years, maybe even until Child's death about 1644. This date of Richard Child's death we can infer from the fact that his regular attendance at meetings to perform his duties as Clockmakers' Warden came to a sudden end in 1644. It makes more sense that Benjamin Hill worked for Child initially when we think it would have been extremely unlikely that it would have been acceptable to either party for Benjamin Hill to have set up a rival business in the very same street and only a few doors away in direct competition with his former master, in whose house he had lived and whose bread he had eaten for eight years or so. It is likely that Benjamin Hill worked for Richard Child, eventually to take over the Child business in 1644 or shortly after. On 26th August 1645 Benjamin Hill was married at St. Bride's church in Fleet Street to Gunetta Sayes. By my reckoning this would have given him a year or more to get his own business established. Unusual though it is, Gunnetta does seem to have been her real name, perhaps a variant of the Latinised Jannetta for Janet. They had several children baptised at St. Dunstan's between 1646 and 1653, though the only one we seem to hear of again later was a son named John. By 1646 Benjamin worked in Boar's Head Alley off Fleet Street in St. Dunstan's parish. None of his sons seem to have followed him in the same trade. Benjamin's son, John Hill, was probably a grocer but took up his freedom in the Clockmakers' Company on his father's death in 1670 by right of patrimony, which means he was entitled to membership because his father had been one. It is unlikely this was to enable him to practice the trade of a working clockmaker, but probably so that he could trade legally as a clockmaker to sell off the considerable stocks his late father had left, which were listed in his inventory. 2. The dial design of this clock could only be from the Civil War period. 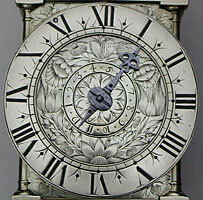 The quality of engraving in the best clocks of this period was never surpassed. Henry Child had joined the Clockmakers' Company in 1641, probably living initially with Richard Child in Fleet Street. In 1648 he took as apprentice named Nehemiah Saye or Sayes, who was the brother of Gunetta Sayes, Benjamin Hill's wife. Being a mere 'Brother' in the Clockmakers' Company he could not take the apprentice directly, but took him 'through' Benjamin Hill. It is possible Henry Child still worked in the same Fleet Street premises as Benjamin Hill, that is perhaps in the former premises of Richard Child, who had died four years earlier. In 1649 Henry Child was married at St. Dunstan's, suggesting that was still his parish church. Whether or not it was the same premises it just shows how strong were these family bonds in business. Business connections were seldom by chance but more often came about through relationships. Benjamin Hill became a Clockmakers' Company Assistant in 1651, Warden in 1652, Master from 1657 to 1659. By 1650 his late master's widow was living in poverty and it may be that the grant from the Clockmakers' Company was one of the first things instigated by Benjamin Hill as he entered into the Company administration. In 1661 Benjamin Hill, then aged 44, was named as executor of the will of William Davenant, as Jeremy Evans discovered. Intrigued as to what the relationship might be between the two I began to investigate William Davenant and came across a man described in records of the day as "William Davenant, called Sir William Davenant" (implying a self-given title), who supplied arms for the King from Holland in the 1640s, became a General in the King's army in the Civil War, was to be apprehended by Cromwell's Government and brought to trial, and then later became a theatre manager and head of a band of theatrical comedians and players, and yet more .... I was amazed at what extraordinary company Benjamin Hill seemed to have kept! Until this William Davenant in fact proved to be a quite different person! The will, to which Benjamin Hill was executor, reveals that that William Davenant was a 'gentleman' owning a farm and land in Halstead in Essex, but had 'a house where I now live in the parish of St. Dunstan's in the West, London' and died leaving a widow with a young son of only eight and two daughters. He appointed Benjamin Hill as executor simply because he was 'my very good neighbour'. Jeremy Evans sets out the 1670 inventory of Benjamin Hill's goods in full, and this is very illuminating. There were very many watches, as we might expect. The picture is slightly complicated however as the word 'watch' was sometimes used to mean a non-striking clock. For example an entry 'severall hanging watches & Clocks, some without weights & springs ...' presumably refers to hanging timepiece alarm clocks, as we could hardly have 'hanging' watches with or without weights. Only one table clock is mentioned, just begun, which would be a spring-driven table clock we would usually call a bracket clock, and this confirms that his specialities were watches and lantern clocks. Some of his lantern clocks are unspecified, but the fact the some are mentioned as pendulum versions means that he was already familiar with pendulum clock making, and the fact that some are described as balance clocks implies he still made those too. Individual values are difficult to ascertain as many items are grouped together in batches. A simple lantern clock however would seem to be assessed at under £2.00, cost to him that is - they would normally retail at about £3.50. One 'pendulam Quarter Clock' at £15.00 was probably a quarter-chiming one, which were much more costly. '2 Turky figured Clocks with Alarms' at £3.10s.0d (£3.50p) are presumably clocks with numerals in Arabic made for export to the 'Turkish' Market covering the Middle East, and this is very interesting evidence of how early this specialised trade began. Four men acted as official 'appraisers' to record and assess the value of goods, which formed Benjamin Hill's inventory. Edward East was one of them. Benjamin Hill had known Edward East as a neighbouring clockmaker just down the street since the year 1632, when he was 15 and East was already an established craftsman in his early thirties. When Hill married in 1645 and his wife Gunnetta came to live in Fleet Street, she too must have come to know Edward East, then aged 44, as a near neighbour for the next 25 years. In her distressed state as a newly bereaved widow in 1670, it must have been some comfort to her to have had the familiar figure of Edward East, then aged 68 and no less a person than the King's Clockmaker, to ease the burden of the ordeal of men tramping through her house, opening drawers, rummaging through all her personal effects and writing down her every possession, even in 'the widdow's Chamber'. 3. Being a balance wheel clock the hammer and hammer spring and stop are positioned on the right. Note the decorative filing to the hammer stop, sometimes called a 'bird-beak' or 'crocodile-mouth'. Another appraiser was Jeremy Gregory, aged 49, best known as a watchmaker in Cornhill, a former apprentice under Edward East's brother, Jeremy, and a close associate, and probably former employee, of Edward East. He was perhaps called in to assist in valuing the watches, of which there were many. Another was Nicholas Coxeter of Lothbury, aged 50, a noted maker of lantern clocks and a former Captain in the Parliamentarian Army during the Civil War, probably called in to assess the lantern clocks, of which there were also many. By 1670 their other former neighbour in the trade, fiery John Drake, was probably dead. He was last heard of in 1662 living in Westminster, when he would have been in his late 70s. But one of the appraisers was a Joseph Drake. I have no means of knowing who he was, but I would be far from surprised if he turned out to be a son of John Drake, again a local and hopefully friendly face, which would be known to Gunnetta. It must have been a motley group gathered in the house on that sad day, the 21st October 1670, in the 22nd year of King Charles, as the inventory labels it - a King who had only been on the throne for ten years but had started counting his reign from 1649, the year his father had been executed and over eleven years before he even came back to this country! Edward East, a Catholic and Royalist supporter and now an employee of the Monarch, with his associate Jeremy Gregory, alongside a former Puritan 'roundhead' Captain in Oliver Cromwell's army! Poor Joseph Drake was wedged between them and must have been walking on eggs, especially if he was the son of John Drake, whose tongue they had all been savaged by. East was a powerful man, a senior figure in the Clockmakers' Company for many years, and had kept his Catholicism secret, until the time of his funeral, when his will specified that his widow should 'bury me privately in the night time and that she give nothing but rosemary at my funerall' - a telltale clause revealing his Catholicism. But a lesser mortal, such as clockmaker John Matchett, who was in turn to be Master himself within a year or two, was suspended from the Company in 1678 by an administration which included East himself on the grounds that he was 'well known to be a Popish Recusant' - in other words for being a Catholic! It was small wonder 'evil words' sometimes crept into the proceedings. All three of the clockmaker appraisers had been Master of the Company at one time or another. As the Company had no premises of its own, their documents were usually kept in the house of the current Master. An amusing incident happened in 1658 when they tried to remove the 'Great Chest' in which the Company documents were kept from the house of Edward East, the current Master, to the house of the incoming Master Robert Grinkin (junior) further along Fleet Street. The chest proved too large to go in through the Grinkins' doorway and they had to leave it instead in the Vestry House to St. Duncan's church! Benjamin Hill was principally a watchmaker and not many lantern clocks are known by him. I know of only five lantern clocks, though there must be others. Matchstick man castings have been noted on some of his clocks - the clock illustrated here has three separate parts each with that casting mark. This is an indication that he bought his lantern castings from the same source(s) as many other lantern clock makers of this period. But principally he seems to have been a prolific maker of watches. His property was destroyed in the Great Fire of London in 1666 and he then moved to Fetter Lane, which is where he died in September 1670, aged about 53, leaving a will and was buried in St. Dunstan's. His daughter, Mary married clockmaker William Young in 1671, though he never lived to see it. His widow, Gunnetta died in 1673. The most surprising thing to me was the value of his assets in his inventory, and the more so when we think this was a man who had survived the Great Fire of London only four years earlier. We can only assume he had been able to rescue most of his stock. In total his goods were valued at over £1,500.00., which in today's money would be over one million pounds. Of that he kept over £400 (three hundred and fifty thousand pounds!) in cash in the house! Not bad for a Warwickshire wheelwright's son. Footnote: published in Clocks Magazine.